A recent (July 2, 2010) post on Quezi: Now You Know (on-line at http://quezi.com/12977) asks, and answers, the question, "Which English town celebrates the Fourth of July?" And I don't want to hear the old joke about "Do they have the fourth of July in England?" The answer is "Yes, but they don't celebrate it as American Independence Day." Well, it turns out that the last sentence may not be entirely true. Apparently, the town of Warton in Lancashire, England, they do celebrate the fourth of July, as the ancestral home of George Washington. 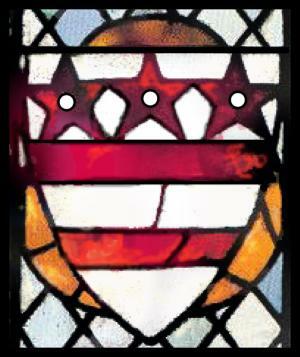 Indeed, the church tower bears the Washington coat of arms. Alas, the site goes on to note that the Washington coat of arms "whose stars and stripes ('two bars and three molets', in heraldry-speak) probably inspired the United States flag." Alas, I am afraid that this is just another one of those stories that have gotten attached to a coat of arms that sound very nice, but simply aren't true. Yes, the Washington arms and the American flag have red and white horizontal stripes, and both of them also have stars on them. But the resemblance ends there, and in fact there is no indication that the Continental Congress in adopting the flag even considered Washington's coat of arms. It is not known with certainty, but the flag was most likely designed by Congressman Francis Hopkinson of New Jersey. On June 14, 1777, in order to establish an official flag for the new nation, the Continental Congress passed the first Flag Act: "Resolved, That the flag of the United States be made of thirteen stripes, alternate red and white; that the union be thirteen stars, white in a blue field, representing a new Constellation." Nothing in the Flag Act or anything related to it indicates any inspiration from the Washington coat of arms. So, as I said, it's a nice story, but alas, unlikely to be factual. Which you'd think that that Quezi ("Now you know") would have, or should have, err, known.